signaling circuits directly from the signal interlocking plan (SIP). The various safety aspects such as interlocking of conflicting routes, requirements of points for each route, the track circuit controls for the points, the route holding requirements such as approach locking and back or route locking and other controls such as crank handle controls, gate controls, block control and overlap release etc. are first put in a table called “control table.” Or “selection table” and this table is used in the preparation of circuits. 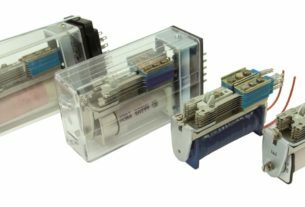 A 2 tier or even 3-tier checking of the control table is done for the correctness and approved by the approving authority before it is translated into circuits. The control table is also very much useful at the time of testing the installation before commissioning. The various columns of the control table are shown in the sheet attached. When a route is set and locked, it should lock all other conflicting route may be. A. Directly conflicting route: Route which require all its points in the same position as that of the route which is set and locked. B. Indirectly conflicting route: Route which require at least one of its points in a different setting from the points of the route which is set and locked. 1. The interlocking between indirectly conflicting route is automatically achieved through the points /points as the point set and locked in one position, say normal for the route set will not be available for the conflicting route which require the point in the reverse position, and therefore, the conflicting route can not be set. For directly conflicting routes, as all the points are required in the same position and are already set, the interlocking can not be achieved through the points. The interlocking has to be specifically provided in the circuits and the same has to be indicated in the control table under the column ”Locks signal routes”. a. A main signal shall lock the shunt signal ahead and vice-versa. b. A main signal shall lock the shunt signal below it and vice versa. c. A main signal shall lock the calling on signal below it and vice versa. d. A calling on signal shall lock the main and shunt signal ahead and vice versa. e. A calling on signal cleared from the main line shall lock the advanced starter of the same direction and vice versa. f. Starter signal at either end of the berthing track shall lock each other. g. Shunt signal at either end of the berthing track shall lock each other. h. A Shunt signal and a main signal at either end if the berthing track shall lock each other. i. Conditional locking shall be provided wherever necessary. All the above interlockings have to be shown in column ”lock signal route “of the control table. 3. The requirements of points, normal or reverse as the case may be, for each route and their detection have to be shown in respective columns of the control table. 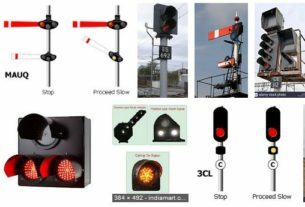 The point control circuits have to be prepared as per the requirements of the points for the route and their detection have to be proved in the route checking and signal control circuits. 4. Before clearing a signal, the route should be clear of any obstruction including the overlap. This is achieved by proving the clearance of track circuits from the foot of the signal upto the next signal, and the overlap track circuits beyond it. All these track circuits have to be shown in the column “controlled by track circuits” and have to be proved in the signal control relay circuits. 5. Other controls such as “crank handle control” “siding point control “, ”gate control “ etc., have also to be shown in the respective columns of the control table and incorporated in the appropriate control circuits. 6. After the signal is cleared ensuring all the above said safety conditions, the route must be held when the train approaching the signal as well as when the train has passed the signal till such time is clears the last point in the route. The former is achieved by providing approach locking on the signal. For the home signal, as there will be no long approach track circuits for this purpose ,dead approach locking is provided. This is shown in the “Approach locked by track circuit column as “dead approach” or as “signal off” which means that the approach locking will be effective once the signal is taken off and can be released only after the time delay of 2 minutes. For other signals, this can be provided with the help of track circuits. Already available in the rear of the signal or dead approach can be provided. 7. Once a train passes the signal, the route is held by providing back or route locking. The track circuits from the signal up to the last point in the route which are used for this purpose are shown in the column ”Back locked by track circuits “are proved in route release circuit. So long as the train is passing over these track circuits, the route cannot be released. 10. The selections for the calling on signal are the same as those of the signal above it except that the calling on signal will not be controlled by any track circuit other than the first track circuit after the signal as a calling-on signal can be cleared even if any track circuit in its route fails or the berthing track Is occupied .The first track is included in the control only to put back the signal to “ON”. It must be noted that for the calling on signal, no overlap is set and as much the overlap points will not figure in the points column. The fact that the calling on signal will clear only after 2 minutes of occupation of the calling on track in rear of the signal is indicated in the “Remarks” column. Even though overlap points positions and the overlap track circuits are not proved for clearing the calling-on signal, shunting or any other movement in the overlap portion is prohibited in the interest of safety. 11. 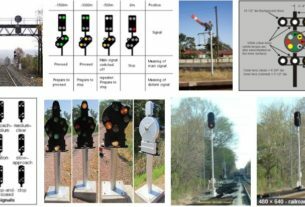 For Shunt signal, the selection is the same as those of main signals. No overlap is required for shunt signal movements. Therefore, overlap point positions and detections are not shown against shunt signal routes. 12. There is no route as such for the last stop signal. It is controlled by the block instruments of the section which is shown in the “remarks” column. The short 2 rail length track circuit after the LSS is shown in the controlled by track circuits column.